Kristin Bjornsen strikes a yoga pose after being stuck in I-95 traffic for more than an hour. When Kristin Bjorsen found herself stuck in a major traffic jam on I-95, she could have resorted to road rage, cursing profusely or blaring her horn in frustration. Instead, she pulled out her pink-and-white yoga mat and stretched into an upward-dog pose on the side of the road. 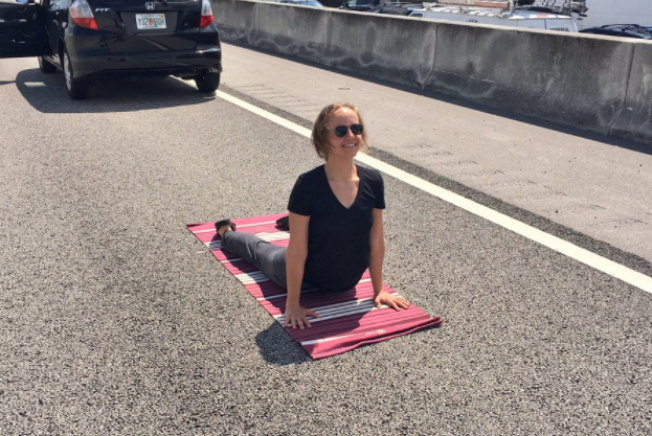 The photo of Bjorsen practicing yoga on one of South Florida’s most detested highways is making its rounds on social media -- a testament to the stress of South Florida traffic. “For me, it was a funny juxtaposition to an otherwise stressful situation,” Bjorsen said. The art director at the Miami New Times was stuck in traffic for more than an hour due to a traffic accident in North Miami, which shut down the northbound lanes of I-95. Bjorsen said she pulled out her mat after inching along the overpass at the Golden Glades. The mat came out near the end of the bridge. She said she has been surprised by the reaction to the photo, which has gone global. “Someone sent me a link to a news story in India about it,” she said. Granted, Bjorsen only struck a single pose during her brief yoga break -- she didn’t want to hold up traffic anymore than the accident already was. But sometimes, that’s all you need. “That’s the irony, that was the only pose,” she said.